The following article by Rabbi Dr Raymond Apple first appeared in The Jewish Bible Quarterly, Vol. 41, no. 4, October-December 2013. The two major lines of Jewish exegesis are p’shat — the plain meaning, and d’rash — the homiletical interpretation. It could be said that p’shat is more objective and d’rash more subjective, but this generalization should not be pressed too far. There is a popular notion that d’rash is a sort of Jewish Aesop’s Fables, a collection of legendary material that provides extra drama and colour; but it would be a mistake to imagine that the masters of Midrash were mere tellers of tales. In most midrashim there is a message which we can begin to uncover by asking: What idea does the midrashic text want to teach? When we ask this question we find that the Sages of the Midrash were serious philosophers who often used d’rash to address major problems in theology and ethics. This paper shows how the exegesis of an ambiguous word in the Bible leads in two different directions, with the contrast between p’shat and d’rash allowing the rabbinic Sages to read important theological content into — or out of — a seemingly innocuous verse. That verse is Exodus 19:17, which speaks about where the Israelites were when the Torah was given. The verse reads vayityatzevu betachtit hahar. If we try to imagine the scene, we may visualise a large crowd gathered in open country with the mountain looming in the background, apparently indicating a p’shat of they stood at the foot of the mountain. Tachtit is connected with tachat, “under, below, beneath”. These translations appear to be interchangeable synonyms, and are generally treated as such. However, they are capable of being separated into two categories — “low/lower/lowest” and also “below/under/beneath.” Because of the ambiguity of the Hebrew words, the translations of tachat and tachtit waver between “at the foot of” and “beneath”. In Brown, Driver and Briggs’ Hebrew and English Lexicon of the Old Testament, ad she’ol tachtit (Deuteronomy 32:22) is translated as to the lowest She’ol (the nether-world). The Jewish Publication Society of America 1917 translation of the Bible renders the phrase unto the depths of the nether-world; the 1962 translation gives to the base of the hills. Three times, in Ezekiel 31:14, 16, and 18, the text has eretz tachtit, meaning the nether parts of the earth according to the JPS 1917 translation, but the lowest part of the nether-world in the 1962 version, which — probably in view of the parallel bor, the pit, at the end of verse 14 — sees it as a reference to She’ol, the subterranean abode of the dead. In that case tachtit is not at the base of something, but below the surface. We thus see that the translation of tachtit varies between “low” and “under”. However, when it comes to Exodus 19:17, the 1917 JPS version translates the Hebrew as They stood at the nether part of the mount. Similarly, the 1962 version reads: They took their places at the foot of the mountain. This indicates — as we noted above — an assemblage in open country at the foot of the mountain: the camp is on terra firma, beside but close to the base of the mountain, with Mount Sinai as an impressive backdrop. This is accepted by Rashi, who writes: “In its literal meaning, (betachtit hahar) signifies beraglei hahar, at the foot of the mountain”. Similarly, Moses’ recollection of the event in Deuteronomy 4:11, Vata’amdun tachat hahar, is understood in both the 1917 JPS version (Ye stood under the mountain) and the 1962 version (You stood at the foot of the mountain) as having tachat refer to the base of Mount Sinai. Rashi adds to his first, p’shat-based comment, a second, contrasting d’rash that the people were standing not at the base of but literally beneath the mountain. This d’rash is linguistically possible in view of the evidence above that both tachtit and what can be at the foot of and beneath. However, Rashi justifies the d’rash not on the basis of linguistics, but on an aggadah in TB Shabbat 88a (with parallels in Avodah Zarah 2b, Mechilta BaChodesh 3, etc. ), where Rabbi Avdimi (elsewhere called Dimi) bar Chama says: “The Holy One, Blessed be He, lifted the mountain over them like an [inverted] barrel (giggit) and said, If you accept the Torah, all will be well: but if not, this will be your burial place’.” The biblical text itself lends no explicit support to this tableau, although the Sages read it into the story in order to draw out a religious teaching. In this aggadah, giggit is generally, but not necessarily, understood to mean a barrel. Jastrow gives several alternatives: “something arched, roofing, a huge vessel, tub, tank (for brewing beer); reservoir.” The word is rather clearly based on the Biblical Hebrew gag, a roof (e.g., Judg. 9:51). The idea of inverting a giggit is not unique to this aggadah; there is also a halachic discussion in the Talmud (Sanhedrin 77a) which reads, “Kafah alav giggit… if one inverts a tub over a man so that he dies.” It should be noted that if a mountain is dropped, its weight and solidity would crush the victim/s, whereas a presumably empty tub, barrel, etc., would kill by suffocation. A further note should be added about tachtit and giggit: since both end in it, the Sages — perhaps with a droll sense of humor — may be positing a contrast of opposites (something low with something high). There are several — non-identical — manuscripts of Rashi’s commentary extant, and in some the threat is not “this will be your burial place” but “I will turn the world back to confusion and chaos” (tohu vavohu; Gen. 1:2). This type of threat is found in a number of other places, e.g., a piyyut (liturgical hymn) that puts into God’s mouth the words, “(If you cavil at My decrees) I will turn the world back to water, to tohu vavohu“. Still, despite their disagreement over details, the various versions of the Midrash all agree that the people were terrified that God would drop the heavy mountain upon them and bury them alive and/or destroy the whole earth, so they had no choice but to accept the authority of the Torah. However, the idea that the Torah was imposed by force alarmed Rabbi Alma bar Ya’akov to such an extent that he feared it would undermine the authority of the Torah by providing an excuse for breaking the commandments (Shabbat 88a). His argument is that since the people were under Divine compulsion at Sinai, if they later sinned they could plead, “Why blame us and punish us? It is not our fault, You forced us to accept the Torah!” By way of response, TB Avodah Zarah 2b-3a advances a theory that even without fully voluntary motivation, which is the ideal, there would still be some degree of reward for observing the commandments. In Shabbat 88a, Rava gives an answer founded on the statement that. in the days of Mordecai and Esther, kiyyemu vekibbelu hayehudim — the Jews confirmed and accepted the duty to commemorate the events leading up to the festival of Purim (Esth. 9:27). Rava explains that the people took time to affirm their previous acceptance of the Torah at Sinai; at first there was an element of compulsion, but now — although the new attitude needed several centuries to develop — they willingly affirmed it. Rava’s actual words are: “They reaccepted it [the Torah] in the days of Ahasuerus; they confirmed what they had accepted long before.” Whether there is a literal significance in the words “in the days of Ahasuerus” is open to question. The fact that the people’s affirmation is attributed to that period may simply indicate “a long time afterwards”. It may possibly hint at the renewal of the covenant in Ezra’s time (Neh. 10:30). The midrashic story of the mountain that became a barrel upturned over the people’s heads introduces a new theological idea — that God forced the Israelites to accept the Torah. In line with common rabbinic practice, the story presents this concept in vivid, homely terms. Without academic philosophical analysis, the story forces the reader to confront head-on the issue of coercion and responsibility. The Midrash seems to teach us that in receiving the Torah there was an element of coercion, along with the willing acceptance mentioned explicitly in the Biblical account (Ex. 19:8). The central question that must be asked is: Why did the rabbis introduce the idea that the Jewish people were forced by God to accept the Torah? The language of the phrase, betachtit hahar, could easily be interpreted to mean “at the foot of the mountain,” and all other indications from the Bible are that the Israelites accepted the Torah willingly. So why did the Sages create a Midrash that introduces the difficult concept of coercion and then have to devise ways to explain that there was also a willing acceptance of the Torah? This question is dealt with by Tosafot (TB Shabbat 88a, kaffa). Tosafot for asks: “Since they said, ‘na’aseh venishma — We will do and we will hear’ [Ex. 24:7: venishma can be translated and obey: see the 1917 JPS version], why did they need a Divine threat?” If — as na’aseh venishma implies — they accepted the Torah of their own free will, why did they need to be coerced? Tosefot explains that it was to make sure the Israelites did not later change their mind. Something that is accepted voluntarily may then be discarded, and it was historically necessary for the Torah to be kept forever by the Jewish people. The lesson would then be that voluntary acceptance might later be abandoned and is therefore not sufficient; there must be a core feeling of loyal obligation that motivates observance of the mitzvot. Another way to understand the role of this Midrash is that it serves to point out that everywhere in human experience we are subject to considerable — and inescapable — coercion. Real spontaneity of action hardly ever happens. Everyone is — consciously or not — constantly affected by lineage, upbringing, and surrounding influences, by heredity and environment, society and state. 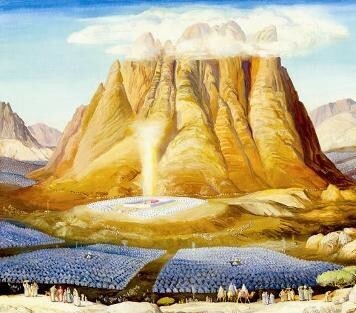 The Israelites themselves were “coerced” to accept the Torah by the awesome miracles that they had recently witnessed, the ten plagues, the splitting of the sea, and the awesome display of God’s Presence at Mount Sinai. Psychologically, could they really reject the Torah under these circumstances? An interesting parallel is found in TB Sotah 34a, where Joshua tells the Israelites while crossing the Jordan that the purpose of their crossing is to conquer the Land of Israel, and if they do not agree to this the water will come and wash them away. The Jerusalem Talmud (Sotah 7:5, quoted by Tosafot; TB Sotah 34a, odam) presents a similar scenario. There, Resh Lakish states that when crossing the Jordan, the Israelites accepted responsibility for each other’s private transgressions. Joshua is then presented as telling the Israelites, “If you do not accept responsibility for each other’s hidden transgressions, the waters will come and wash you away.” Here again, the Israelites are forced to accept responsibility under pain of death. Conceptually, what does this account have in common with the Mount Sinai episode? Perhaps the idea is that the acceptance of the Torah, the willingness to fight for the Land of Israel, and the concept of mutual responsibility are all fundamental to the idea of the Jews as a people. Without a shared set of values and a sense of a common homeland and destiny, there is no glue holding the Israelites together as a distinct entity. That is why they are “forced” to accept these obligations, for without them the Israelites would cease to exist as a people and be washed away like many other civilizations. Another way of viewing this Midrash is that it teaches us that the relationship of the Jewish people with the Torah develops over time. Rabbi Abraham Isaac Kook (Ein Ayah, vol. 4, on TB Shabbat 88a) develops this point by suggesting that it is a basic element of Jewish experience and identity that a Jew should constantly internalise — with increasing depth — the Judaism he/she already has. The Midrash notes that the acceptance of the Torah at Sinai was just the first step in a process that culminated only in the time of Esther, at the very end of the biblical period. One is reminded of the question – said to have been asked of one of the Chassidic teachers — as to why the calendar has a gap of several months between the festival of Shavu’ot, when the Torah was given, and Simchat Torah, when it is celebrated. The response attributed to the particular rebbe was that the encounter at Sinai which bound God and Israel started as an arranged marriage, a shidduch, but then, with time, the spouses came to know and love each other and could now rejoice with one another unrestrainedly. This concept of a developing relationship with the Torah may also lie behind the approach offered by Midrash Tanchuma (No’ach, ch. 3), which states that na’aseh venishma denotes the Written Torah and har kegiggit the Oral Torah. This distinction is quoted and apparently accepted by Chizkuni, who ends his remarks on Exodus 19:17b with the brief statement, Torah shebe’al peh lo kibbelu adayin, “They had not yet accepted the Oral Torah”. This implies that the people accepted the Written Torah at Sinai, but were initially reluctant to commit themselves to the Oral Torah, although time allowed them to subsequently discover and recognise its wisdom, and that is when they confirmed it. This approach indicates the crucial role of the people themselves in the evolution of the Oral Torah. The midrashic material that we have assembled provides a way of addressing philosophical issues, especially the ideas of coercion and willing acceptance. The rabbinic d’rash on a verse in Exodus is thus a peg on which to hang an exercise in serious philosophy and must not be dismissed as merely a colourful narrative, a figment of the homiletical imagination. 1. Roget’s Thesaurus of English Words and Phrases, abridged edition (Harmondsworth, Middlesex: Penguin Books, 1964) sec. 207. 2. Oxford: Oxford University Press, 1957, p. 1066. 4. Marcus Jastrow, Dictionary of the Targumim, etc. (New York: Title Publishing Company, 1943) p. 234. 5. Eleh Ezkerah, Musaf service for Yom Kippur. 6. Chizkuni (Hezekiah ben Manoah, 13th cent.) picks up a comment of Bechor Shor that, as a result of the series of natural phenomena which punctuated the Revelation (Ex. 19), the people were charedim viyere’im latzet — “trembling and afraid to go out”; and he suggests that the people protected themselves by cowering under the mountain — mipenei pachad hakolot vehaberakim, “because they were afraid of the thunder and lightning”. Their fear and awe may have been at the solemnity of the moment. This view could have been influenced by the Mechilta (loc. cit. ), which applies to the Children of Israel the verse, yonati bechagvei hasela — O my dove that is in the clefts of the rock (Song of Songs 2:14), the dove being a poetic term for k’neset Yisra’el, the congregation of Israel (see Ps. 74:19, TB Bava Kamma 93a, Cant. R. 1:15. 4:1, etc. ), although “in the clefts” is not at all the same as “beneath.” One wonders why the Mechilta did not find a precedent in Exodus 33:22, vesamticha benikrat hatzur — I will place you in a cleft of the rock. Despite Chizkuni’s suggestion, the Rabbi Avdimi version with its story of Divine duress remains popular in Jewish thought. 7. Confirmed and accepted is a literal translation of the Hebrew, although the 1917 JPS translation reads ordained and took upon them and the 1962 version says undertook and irrevocably obligated themselves. The context makes it clear that what the Jews of the time undertook was the annual celebration of Purim. Verse 23 of chapter 9 states, The Jews took upon themselves as an obligation what they had begun to practice, which implies that their spontaneous rejoicing at the time of the actual Purim events was thereafter formalised to bring into being an annual festival that became binding upon them and all future generations. This decision was made by Mordecai and his rabbinic contemporaries, using the authority to make enactments conferred by Deuteronomy 17:9 upon the judge that shall be in those days. 8. Whichever interpretation one accepts, there remains a linguistic problem in the ketiv, the written text of Esther 9:27 (similarly in verse 23), which spells the word for “accepted” as kibbel – in the singular. 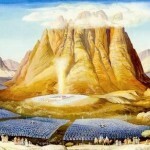 The view of the Zohar is that Moses (in the singular) received the Torah and the people (plural) confirmed it. Moses acted on their behalf; they then ratified his action. • Psalm 34 – does the heading fit? • Shirat HaYam: Miriam’s Song? This entry is filed under Articles, Bible/Tanach.